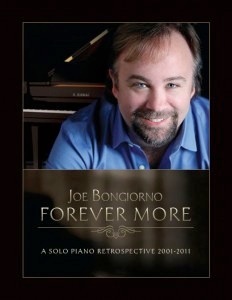 Forever More is the companion songbook to Joe Bongiorno’s “solo piano retrospective” CD which covers the years 2001-2011. The fifteen songs come from Joe’s previous six albums plus one new track. This beautiful book has a glossy full-color cover with the photo from the CD cover and is spiral bound. 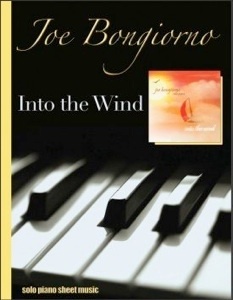 The layout of the music is spacious, clear, very easy to read, and is printed on a slightly heavier paper stock that should last with many years of playing without interfering with quick page turns. 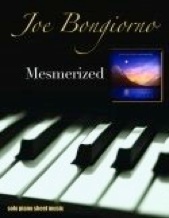 Most of Joe’s music tends to be slow and mellow, so these songs are not overly difficult to play. Pianists at a late-intermediate/early advanced level should have no problem mastering these pieces. There are few, if any, reaches of more than an octave, and most of the left hand parts are running eighth notes rather than blocked chords. A few of the songs have somewhat tricky key signatures, a few have some challenging leger lines, and all of them have the metronome settings to indicate the desired speeds. Suggested pedaling is given and dynamics are marked. This is a very relaxing and enjoyable collection of piano solos and is available from www.solopianomusic.com. Recommended!